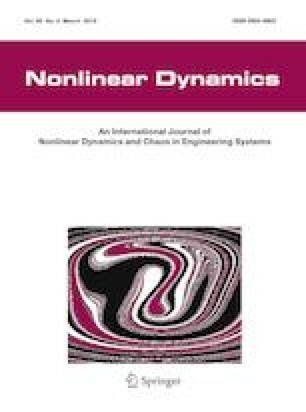 An experimental study of the single-well and twin-well, also referred to as intra-well and inter-well, respectively, nonlinear dynamics of a bistable composite laminate is presented. An asymmetric four-ply [0/90/0/90] carbon fiber laminate with two cylindrical stable equilibria supported at its center and free at all boundaries is used for the experimental testing. The mechanical bistability makes the laminate able to snap from one stable equilibrium to the other when displacement reaches a critical value. This snapthrough motion is highly nonlinear and associated with large-amplitude vibrations. This property opens chances for bistable laminates in morphing and energy-harvesting applications. An electromechanical shaker is used to excite the laminate at its center by a controlled amplitude and frequency excitation. The dynamic response of the laminate is measured using a Polytec laser vibrometer. In addition, four macro-fiber composite actuators are attached to the laminate to measure the output voltage due to vibration and hence assess its energy-harvesting capability. The laminate’s natural frequencies and damping under small-amplitude excitations that would match the natural frequencies of an underlying linear system are experimentally identified. A primary resonance excitation of the first bending mode is carried out using amplitude sweep and frequency sweep. It is shown that in both cases, the response starts as a small-amplitude single-well vibration around the static equilibrium position. Varying the excitation amplitude or frequency, the response exhibits a period-doubling bifurcation associated with higher levels of vibration. As the excitation conditions are varied further, the laminate snaps from one equilibrium position to the other. This snapthrough motion is characterized to be of a frequency that is half the natural frequency of the excited mode. It is shown that the period-doubling cascade is responsible for the escape from the single-well to the twin-well response. A secondary Hopf bifurcation that creates a period-three motion and a chaotic snapthrough were also identified. Two low-frequency interesting modes that are attributed to the elasticity of the midpoint support, referred to as rocking modes, were identified using a hammer. These modes got repeatedly excited via subharmonic resonance of order two. In terms of the energy harvesting, the snapthrough motion was found to greatly enhance the energy extraction capability. The frequency band of significant power generation was found to be about 25% of the excitation frequency, which is a good ratio for a single excitation frequency.